Hi everyone. Am doing a coolant flush and re-fill. Previous owner used green coolant so il stay the same. Whats the best green coolant around thats easy enough to get from supercheap, are the premixes any good or is it better to dilute your own. Also do i need a special anti freeze anti boil mix? The one, the only, Toyota red. Any coolant will help not boil, Toyota red formulated for the metals within the Mr2 system. IMO. Best to flush the system, use distilled water not tap, replace your thermostat at the same time (ATS Racing does a high flow low temp should you be running higher boost or track, auto stores do a highflow), replace radiator cap. I like to overdo things and gives peace of mind until kms are done to service again. 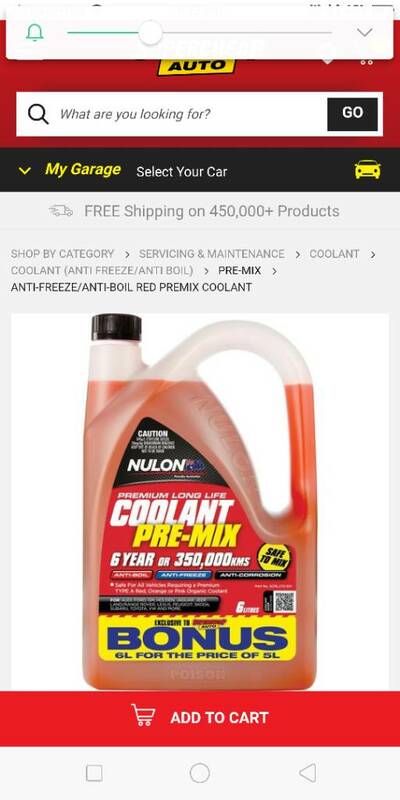 Any opinions on Nulon coolant? and... Green or Red? Its gotta be red OAT coolant, dunno about different 'performance' levels of coolant but from learned knowledge the green has the wrong mystery formula, the red OAT stuff has silicates (or doesn't?!) - or whatever stuff is right for our engines. Drain and rinse the lot of that out, use red OAT, the premix/concentrate argument comes down to cost, not sure of the top of my head how much coolant goes in as a total, but its more than compared to fwd cars. You probably won't need anti-freeze unless you live in a cold part of the country. A quick innanet search says you'll need around 13 litres, thats if you drain every drop out. There's a few drain points on sw's some are easier to get to than others. Do you think i could just jack the end up high and drain and flush it all out the front radiator? Being the lowest point it should have all of it goin there anyway right. Am i wrong? You can use anything (see the enthusiast comments above) and it will keep the car cool and appear to be the same colour. How it reacts with the metals within the Mr2 coolant system is another aspect. Toyota Red from a Toyota dealership for a Mr2. Read the bgb, there are drain points to successfully get it all out. ^ I think as long as its OAT coolant it will be fine. For the last 12 years in my sdub I have only ever used TOYOTA RED CONCENTRATE mixed 50/50 with distilled water. Apart from zero cooling problems, replaced at 2 year intervals, it always comes out with zero sludge or sediment, and hardly any discoloration. The Toyota red stuff doesn't cost much more than other premium brands anyway, so why not use it? As Tony says "formulated for the metals within the Mr2 system"
To be more specific: Apart from the alloy head and cast iron block, that means especially the copper radiator, and copper heater pipes, etc. One thing to know!! Be careful with pre-mixed. Toyota also sell a PINK PRE-MIX but if you put that in it will ruin your original copper components. What can i do to ensure all the green coolant is out. Should i flush it with all the drains opened aswell as the hoses attached? Read the bgb, if you don’t have a copy download it. The bgb will point out the drain points in the hardliners under the car, the engine drain point (from memory), and the radiator. If you have green in your system, remember also clean out the overflow bottle in the engine bay. Full flush is required - fill system with distilled water, run vehicle, and flush/drain system at all drain points (as per bgb). You can use a compressor blow tool (with wet cloth to seal at tool point) at the various points to help blow remaining water out (though 99% will drain out). Then fill with Toyota Red Coolant, ensure full bleed as per bgb. If you use anything other than Toyota Red - if you are skipping steps - you are creating a receipt for disaster. If you don’t want to take onboard advice from the manufacturer, those with experience, let me know and I won’t respond with the same advice again and again. This is my first time doing it on the mr2 so once i have it down future flushes should be fine.